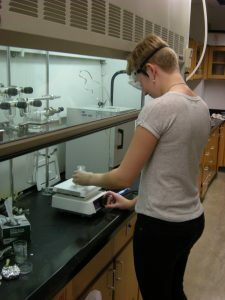 For the past two years, I have conducted research under the supervision of Dr. Joshua Sebree and Dr. Marek Sliwinski in the Astrochemistry Laboratory at the University of Northern Iowa. Our laboratory’s ongoing mission is to create and study aerosols, which form as a result of the radiation of organic gases by ultraviolet light. It is believed that aerosol production was present on Earth during the Archean Era, similar to the observed production on Titan and Pluto. Currently, I am investigating whether Earth soil bacteria can grow using these aerosols as a primary nutrient source. The results of this study will provide new insights as to how Earth’s atmosphere could have supported primordial life.